The Artificial Reef Society of B.C. a non-profit society founded some 15 years ago to promote Dive Tourism in British Columbia is working with local recreational diver Peter Luckham of Thetis Island to create an Artificial reef in the waters off Chemainus and Ladysmith. 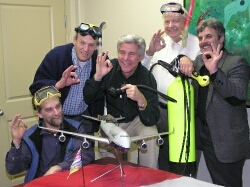 The Artificial Reef Society of British Columbia (ARSBC), local dive operators and divers. These are the people spear heading this project. Support is coming to the project through local business, and government. We believe this whole project is about communities and people working together for the greater good. The aircraft has been acquired and prepared by volunteers, primarily from Vancouver, The Sunshine Coast and The Comox Valley. Thanks especially to the Emerald Sea Dive Club of Edmonds, Washington, and the Ocean Pro Dive Club of South Surrey. The ARSBC is not new to the concept of sinking objects as marine habitat and dive destinations. The ARSBC has directly sunk 4 Destroyers and 2 other large vessels in British Columbia waters over the last 15 years and has provided technical support and consultation to other reef society's around the world. Credit must also go to Tourism B.C., Tourism Vancouver Island, the Nanaimo Dive association, the Comox Valley Dive association, and many others for bringing British Columbia into focus in the dive tourism industry. Around the world Artificial reefs are funded and supported by Sports Fisherman local and state governments. Recognized for there value to the environment and Marine Tourism development, fully supported programs are sinking not just one or two vessels but hundreds, along with tones of specific built concrete structure, and procured "rubble" selected as cost effective habitat for fisheries renewal. In order to have reached this point where Artificial Reefs are a proven technology many have contributed over the last 15 years to sink the reefs here in B.C. and the world. The ARSBC has a proud history in the waters of British Columbia and many locations around the world. This group of non- professional divers biologists and volunteers have successfully sunk 6 large vessels and in turn brought millions of tourism dollars to British Columbia Coastal communities and assisted or consulted in the creation of artificial reefs in a number of other locations around the world. A unique opportunity arose a few years ago when a Boeing 737, a 130 seat passenger airliner was retired at Vancouver Airport. The aircraft had reached a service threshold that required major rework of the airframe for continued service. The aircraft was parked as an economic decision and sold to QWEST for parts, such as engines, landing gear, avionics etc. After the aircraft had been stripped of everything of value the airframe was offered to the Artificial Reef Society for use as an Artificial Reef. The ARSBC set out to find a community that was interested in either expanding existing dive tourism or finding a community that wanted to create their own Scuba Tourism opportunity. 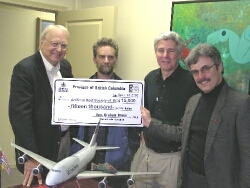 After a couple of attempts by other communities to acquire the project it was local diver Peter Luckham who through a shear passion for diving was able to raise enough seed money through donations from local and provincial government as well as local business, private citizens and divers to bring this project to the Cowichan region. Along with cranes, tugs, barges, permits, materials, donated goods and services it is estimated that this project is in need of $66,000 in cash. To date $51,000 has been raised, another $15,000 needs to be found if we are to make this project a success. It has been predicted, based on Nanaimo Tourism statistics, that this project will generate in excess of $200,000 in revenues for our communities, and $2,000,000 worth of marketing exposure world wide including a Discovery Channel Documentary Feature presently underway. This project is in need of both corporate sponsorship and letters of support to meet it's goals for a January 2006 sinking. Join us in making this dream a reality.